The public was invited to review and provide comments on a public discussion paper released as part of a comprehensive timber supply review for the Cassiar Timber Supply Area. The discussion paper described the geography, natural resources, forest management and land use plans of the Cassiar Timber Supply Area. The chief forester’s allowable annual cut determination is an independent professional judgment based on information such as technical forestry reports and input from First Nations and the public. The previous allowable annual cut was 305,000 cubic metres. Under the Forest Act, the chief forester must determine the maximum amount of wood that can be harvested in each of the province’s 38 timber supply areas and 34 tree farm licences at least once every 10 years. However, a new allowable annual cut may be determined earlier in response to abnormal situations, or postponed for up to five years if an allowable annual cut level is not expected to change significantly. The Cassiar Timber Supply Area covers about 13.1 million hectares, but only 210,658 hectares is available for timber harvesting. 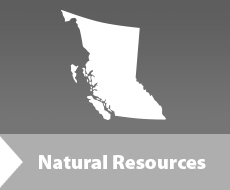 While representing one-sixth of the province, the timber supply area is the least populated, with First Nations making up approximately 60 per cent of the population. Communities in the timber supply area include Dease Lake, Atlin, Telegraph Creek, Iskut, Good Hope Lake and Lower Post.